e.g : phagocytosis by macrophages with subsequent release of cytokines like Interleukins which recruit leukocytes to the site of infection. * Activates NK-cells (Natural killer cell) which are primarily responsible for direct killing (cytotoxicity) of viral infected cells. *Furthermore, inhibitsbacterial hyaluronidase enzyme thus decreasing the bacterial spread among tissues. Echinacea extract: its activity is directed towards the nonspecific immune system. Vitamin C, a potent antioxidant, plays an important role in supporting the immune function and helps to neutralize harmful free radicals in cells. 2. Diabetics, pregnant females and with chemo or radio therapy. 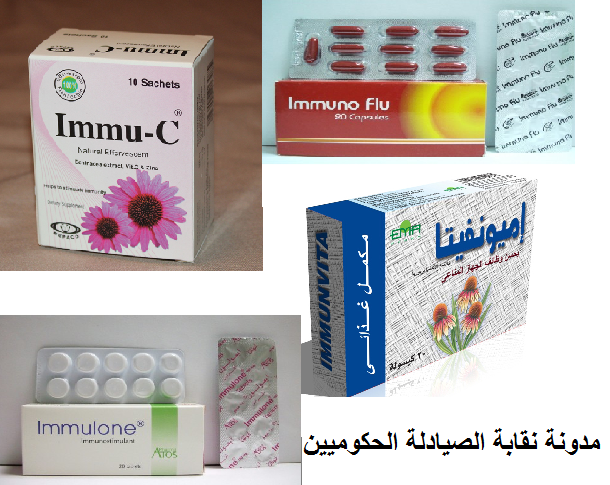 4. infections like common cold, sinusitis, otitis media, pharyngitis and bronchitis. لا ينبغي أن يؤخذ في حالة فرط الحساسية المعروف إلى أي من مكوناته.